Hi friends! Tomorrow is the fist day of June and I have already been seeing calls for vendors at local sidewalk festivals, farmer’s markets and community fairs hitting my Facebook wall. If you are considering selling your art work or crafts soon check out tonight’s video where I tell you about the 4 P’s of Marketing! Product: This is your beautiful artwork. Whether it is a painting, a necklace, cards or purses this is the thing you make. You need to take a good hard look at an item you want to sell and ask yourself “Would anyone want to buy this?” and “Who would want this?” You need to keep that person in mind. Sometimes what you make for yourself because you love it will be different from what you would make to sell, for instance, I love bright colors and bold patterns so that is what I make to keep but what I make to sell will be more on trend and conservative because most people do not dress like me and they might even think that purple, orange and turquoise clash, hard to believe I know. Price: How much you will charge for an item. Generally it is figured by the cost of raw materials plus overhead (labor and overhead like a % of studio rent and utilities, packaging etc.) plus a profit margin. You are probably thinking “Hey, I am the labor, why do I need a profit on top of that?” Because there may come a time when you need to hire help to fill or package orders and you will need to account for that expense as well. You also need to temper this price by what the market will bear and what other artisans are charging for a similar product so the price you can charge in a ritzy city will be different that what you can get in the country but it is a starting point anyway. Place: This is where you are selling your goods. Don’t expect to get Upscale prices if you are selling your jewelry at a yard sale (Top tip from RichMomBusiness.com BTW!) Your items need to be sold where the customers will value them. Fun and funky costume jewelry will go well at casual festival while more upscale pieces will sell better in a gallery setting. I have a rented booth in an antiques mall that works great for selling my cards, earrings and watercolors as they make great add-on purchases for items customers buy from other vendors. You might also decide that your local economy is not diverse enough to find enough people who want to buy your wares and selling online might be a better bet for you. BTW, RichMomBusiness has a free ETSY Webinar coming up if you wanted to check it out. Promotion: This one I save for last but it is equally as important because what is the point of making all the beautiful things to sell if nobody sees them? When you are picking a place see if there is any promotion included. Is the festival advertised? If you are selling in an online multi vendor marketplace does it have built-in traffic? if you are making your own website from scratch how are you going to get people to see it? Now it is so easy to get the word out via social media and ask your friends to share it too expanding your network because it only takes a second to hit the share button. Maybe you will post some flyers on community bulletin boards or offer a coupon for a free trinket to shoppers ahead of time. Don’t skimp here, this is probably the hardest, out of the comfort zone, “P” of them all but it has to be done if your business will be a success. Now I ask YOU, have you ever tried selling your work? How did the “Ps” fit in. Can you identify any parts of your marketing plan that were off? If you want to make money selling your work I advise that you jump in and try. You will learn more from your failures than your successes so if you compare the cost of a bad craft fair vs. the cost of a business class it was a sweet deal on education! You learn by doing, these tips I share are to get you started so hopefully you can learn from my experience and grow faster. Good luck! I want to take a moment and thank Renae Christine from RichMomBusiness.com for sponsoring my YouTube videos during the month of May. This gal knows her stuff especially about selling handmade items online. You can check out her FREE 3 handmade training video series here and tell her “Hi!” from me. She can teach you way more about online sales than I ever can and her tips even help me with my brick and mortar sales. Thanks for stopping by and til next time happy crafting! Don’t squeeze the pen so hard Lindsay! Hi friends! I am feeling like a big doofus tonight because, as you will see in tonight’s video I am seriously clueless as to how to use a Wink of Stella pen. I just got my first real one this week and I loved how sparkly it was but at my rate of consumption I was going to use it up in a week! Apparently after you get it going for the first time you do not need to squeeze it (although I am pretty sure it says push or squeeze on the side of the barrel and I did by golly!) So, if you get one of these don’t squeeze it so much LOL! Many YouTube viewers said their pen lasted over a year and you can add water to it after round one is used up. Also don’t toss it because it is a really nice water brush when you are done too! Tonight I am going to use a very underutilized tool in my studio, embossing folders, with watercolor pens to create a couple colorful cards! Try this technique with the embossing folders and watercolor markers you have (or pick up some at Hallmark Scrapbook, it helps support my blog) and til next time happy crafting! Polaroid Winner and There is still room to get into my watercolor techniques class! Hi friends! Happy Friday! It just occurred to me that next week at this time I will be relaxing after teaching 2 classes at the Heirloom Stamp Show…more on that later, first I need to announce the winner of the Polaroid Zip Printer (drum roll….) Melissa Clodfelter! Yay! Please follow he instructions in the email I sent you so we can ship out your prize! OK, stamp show housekeeping! I still have some room in my Watercolor Techniques for stampers class June 5th from 10am-12noon. In this class you will make 4 cards and learn how to expertly color a stamped image! Of course I have goodies for you! You will get to keep the small reusable plastic palette and the paint that is in it (watercolor goes a long way so you should leave with enough to complete more projects at home) AND thanks to my friends over at Royal Brush you will take home a beautiful brush that will give you years of painting enjoyment. Plus the 4 lovely cards you will make. Not bad for the super low price at $35! You can register online here. But wait there’s more! Kathy and Lorraine will be there too! (BTW Kathy and Lorraine, if you are reading this would you mind coming over to the LCD booth at 1pm next weekend?) I’m like 99% sure they will show up. Thanks to Creative Options for the cool tote and for sponsoring that video! If you had your heart set on taking the Using Watercolors to Stamp class you might be able to get a spot, there were only 2 spots left early this week when I called but it is worth a try. That class goes from 12:30-2pm and Students will make 3 cards and get the palette and brush as well! Love the free swag! If interested call Heirloom at 541-574-8000 to check availability, who knows, someone may have cancelled. I plan on reporting from the show, I ordered a smart phone (who am I? It is a crazy upside down world!) so I can post photos and video. I plan to be most active on Twitter and Instagram so follow me if you want some behind the scenes and also pics of stamp show goodness! I also want to try shooting video with my new Android phone for you tube. Those are my intentions anyway. Wish me luck:) That’s all for tonight! I’m off to watch the kids play ball. Thanks for stopping by and til next time happy crafting! A Thoughtful Gift for Dad! Watch the video to see how easy and affordable these IOU chore coupons are to make using supplies from Papermart! 1. 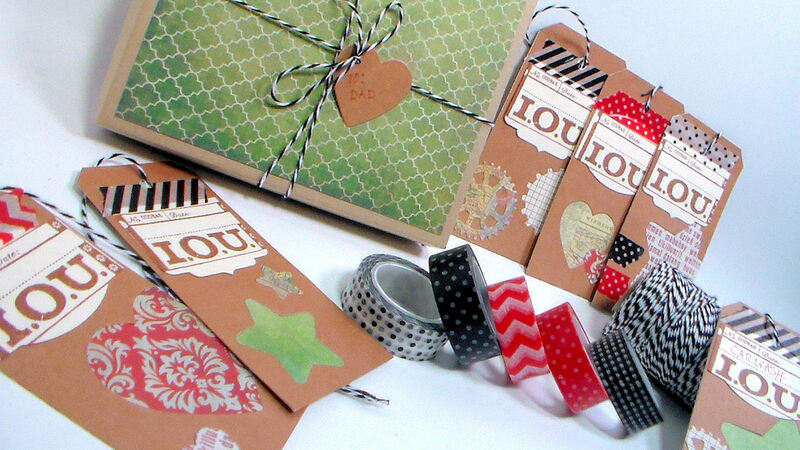 Cut shapes out of kraft tags and adhere tag over patterned paper. Die cut or punch complimentary shapes from paper scraps. 2. Stamp IOU ticket with brown ink on cream cardstock and cut out. Adhere to tag with washi tape. Add extra die cuts with wet glue. 3. Re-punch hole in tag and add bakers twine. 4. Write what the “coupon” tag is good for (such as a car wash, raking the yard, sweeping the driveway etc.) 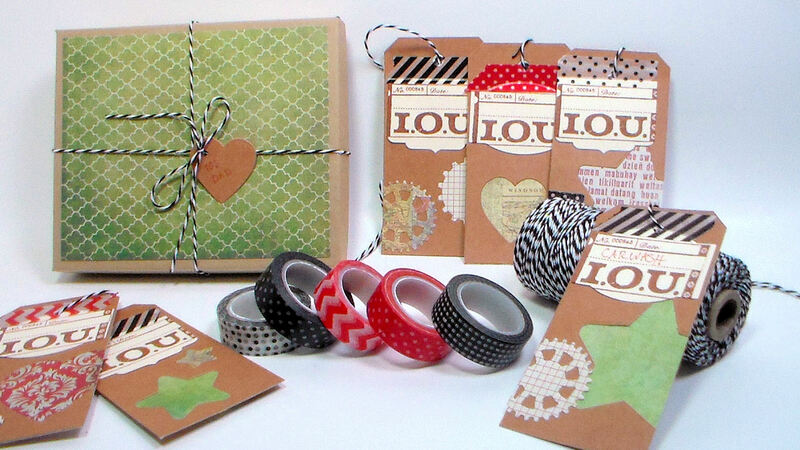 on the ticket and package in a kraft jewelry box that you can decorate with paper and tie with string. Think of other ways YOU can adapt this idea to your needs, maybe make a set of bookmarks to give someone with a gift card to a local bookstore or a booklet of “free babysitting” coupons for a friend or sister. What you are giving someone is time to do something they enjoy and time, like all the best things in life, is free and priceless. Thanks so much for stopping by and til next time happy crafting! Has it been THAT long? A watercolor tutorial! Hi friends! I have been doing a lot of painting for a freelance project that I am working on so I did not realize how long it had been since I posted a watercolor painting tutorial! My apologies 🙂 Please accept this humble tutorial (viewer requested) of a stargazer lily (you can find the reference photo by Tracee Murphy here) for your painting enjoyment. The watercolor pencils I sketched with can be found here. You can use any brand you like but the Primas are a good value for the quality. I hope you enjoyed this tutorial and til next time happy crafting! Sometimes you just need to relax and color! Bow Making Jig: My hubby makes these out of beautiful hardwoods, if you want to order one you can email me at artstudiosofbangor@yahoo.com with “Bow making Jig order” in the subject line. They are $20 plus shipping (USA Priority mail $6, First Class Canada $10, Everywhere else $15) Let me know where you want it sent so I can apply the correct shipping. You can use whatever watercolor markers you have for this technique. You can substitute watercolor paper for cardstock but it does not always blend as nicely, I’d test on a scrap of you cardstock first so you don’t waste it. Above linked products are from Hallmark Scrapbook, I am an affiliate there and if you click a link and make a purchase I receive a small portion of the sale. Oh! They also have all of their We R Memory keepers Punch Boards on sale for 50% off, $9.99 each! And I was thinking of this because I need to make a custom envelope for this card and I could not believe they were all so cheap! 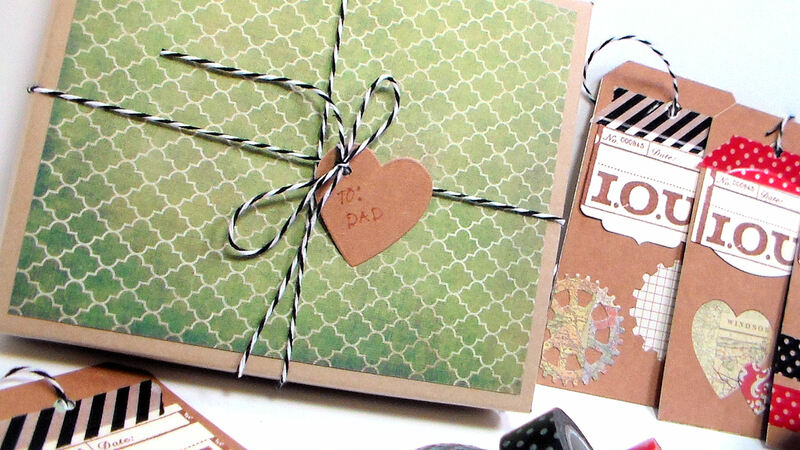 I love the envelope punch board because you can make boxes and bows with it too. I am thinking about grabbing the flower punch board while it is on sale, what do you think? Have any of you used it? I like to use flowers on projects and it looks fun! So, the next time you are feeling stressed do a little coloring! I have a new real-time watercolor tutorial filmed and it will be up in a few days, I guess I just needed to chill a bit before that would happen. 😀 Thanks for stopping by and til next time happy crafting! Hi Friends! I hope you had a great memorial day. Ours was quiet and relaxing and included a quick trip to the pond for a swim. I thought for sure it would be packed but we were the only ones there, then again there was ice in the water a couple of weeks ago LOL! Let me add, the kids swam, I sat on the beach and read. I’m sure many of you had large family get togethers today that might have involved lawn games or other friendly competitions. Wouldn’t it be fun to give the winner (especially if it was a kid) a blue ribbon? Today I’ll show you how easy it is to make one using ribbon from our sponsor Offray. 1. Glue cardstock to lightweight cardboard (like a cereal box) and cut out circles the size you want the center of your award to be. Cut an extra for the back. OR you can cut the circles from colored matboard. I used circle dies for this. 2. Cut 9″ pieces of both ribbons at an angle for the tails. 3. Use glue or double-sided tape to make a #1 on the cardboard circle in the front and sprinkle with glitter. Let dry if using glue. 4. Using hot glue adhere the end of the wide blue ribbon to the back of the circle. Keep adding glue and pleating the ribbon as you press the edge in the glue. Continue until you have gone around the circle. 5. Glue on ribbon tails. Add finishing circle to the back and glue on a pin back. Make a blue ribbon for yourself while you’re at it because you’re #1 in my book! Thanks for stopping by and til next time happy crafting!